Casey and I said our vows on a windy day in Texas two years ago. 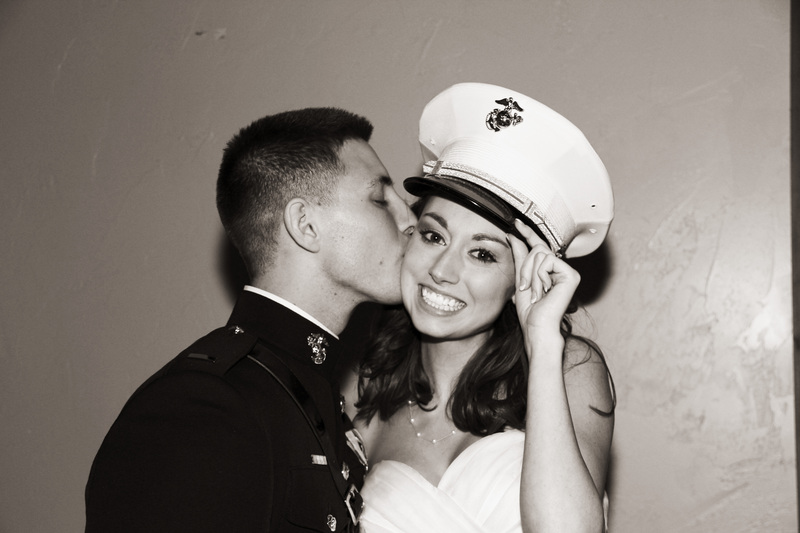 We spent the following six months apart from each other as Casey completed his flight training in California and North Carolina, and then we moved across the planet. 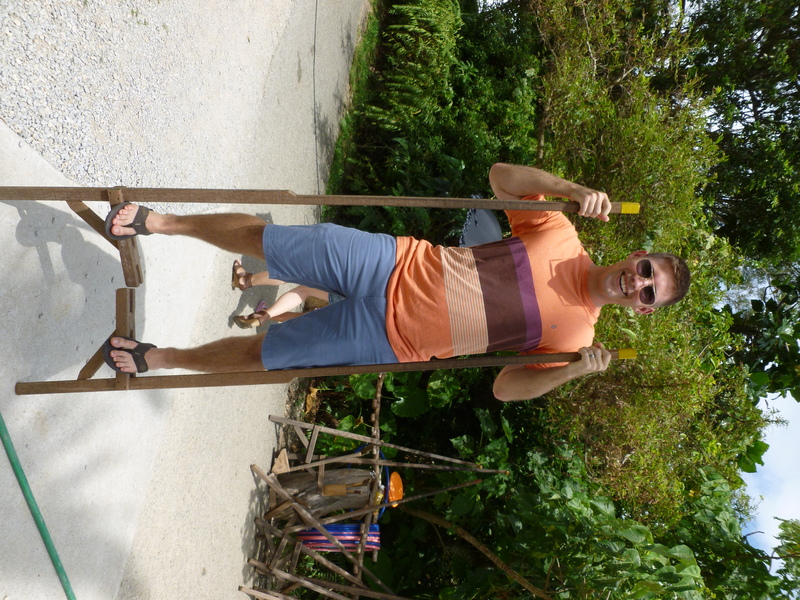 After arriving in Okinawa, we dealt with many adjustments in the time we were able to spend together. It would be dishonest to say it was easy. With all of the changes in our lives during such a short period, we did not have much time to focus on us. All the moves and changes also left us no chance to go on a honeymoon. Last month, we finally made that happen– two years late, but incredible nonetheless. Two of our closest friends currently live in Seville, Spain, so we could not pass up the opportunity to see them and have them show us around (probably) the coolest country in the world. As I had never been to Europe, we decided to make a honeymoon out of it via a cruise through the Mediterranean. We packed as much as we could into this almost-3-week-long trip. 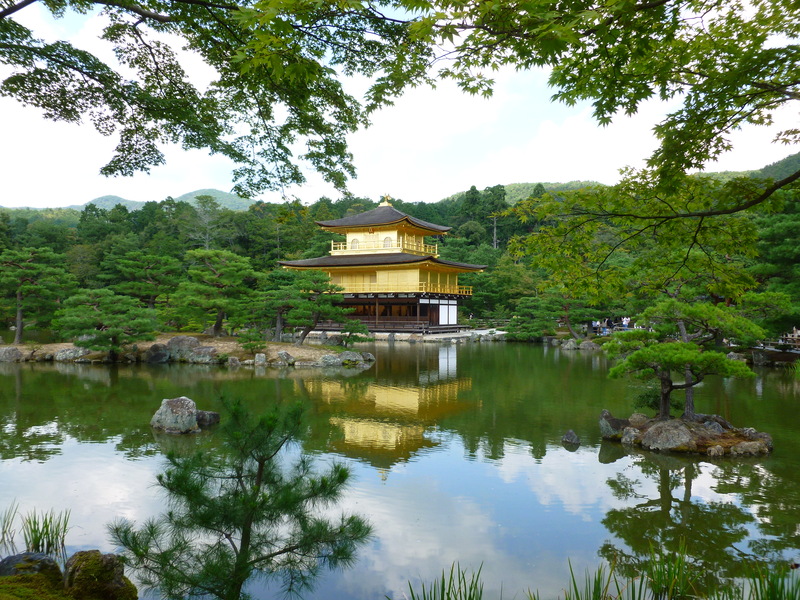 Our 30+ hour flight experience took us from Okinawa to Tokyo, Doha, and finally into Barcelona. Exhausted but excited, we found our way to our adorable bed and breakfast, ANBA, which provided tasteful modern decor juxtaposed with original nineteenth- century hand-painted ceilings. We cleaned up and then went out to meet Barcelona. We walked through the streets of Las Ramblas, spending time in the Boquería, the most colorful market I have ever seen. Everything from fresh squeezed fruit juices to paella, eggs, pastries, fish, jamón serrano, truffles, and lamb heads, are fresh and on display in gorgeous array. Barcelona is a city that is truly alive. Everything from the architecture to the food pulsates with a vibrancy that is uniquely Barcelona. It goes without saying that I did not want to leave. We went to bed early on our first night there, then spent the morning and early afternoon at La Sagrada Familia, an unfinished masterpiece of the late architectural genius Antoni Gaudí. No photo can come close to capturing his brilliance, and I remain in absolute awe of his work. La Sagrada Familia in particular is an incredible work of art, as every elemental detail is cutting edge in its design and construction. I am amazed by Gaudí’s ability to plan and begin construction in 1882 on what is seen as a modern architectural marvel in 2014. Despite ongoing construction on the building, this was a major highlight of our trip. That afternoon, we jumped in a taxi and headed to the port to embark upon the Costa Serena, our home and transportation for the next seven days. In case you are wondering, yes: this is the sister ship to the Costa Concordia, whose recent journey ended in the deaths of 32 passengers when it ran aground outside Tuscany in 2012. As we expected, Costa had ramped up their emergency procedures in response, and we felt safe but slightly annoyed by all of the safety reminders announced daily in seven languages. The ship was massive, and filled with passengers speaking every language you can imagine. We enjoyed multilingual performances, all-inclusive food and drinks, dancing, beautiful Mediterranean sunsets from our balcony, and making friends with an awesome British family who provided companionship and entertainment throughout the trip. From Barcelona, the Costa Serena carried us along to Marseille, France. While our plans to hike Les Calanques did not work out, we enjoyed casually discovering the sights of this lovely old city. We visited a gorgeous old cathedral, walked through the shopping district, savored fantastic espressos and lunch at a local cafe, and relaxed in the sunlight looking down over le vieux port de Marseille. It was just the day we needed. From France, we headed on to the shores of Savona, Italy. Our planned excursion to tour the local vineyards along the Italian countryside was unfortunately cancelled, so we took the opportunity to visit Monaco. The two-hour-long bus ride was the most beautiful drive I’ve ever experienced (sorry, Big Sur), taking us through gorgeous villages along the mountains of Liguria. As we approached Monaco, I understood why the wealthiest people in the world retire there. The entire (2.02 square kilometers) sits surrounded by stunning blue water and beautiful French countryside. In addition to its beauty, Monaco sports a very attractive tax code, explaining why it manages to be both the second smallest and the most densely populated country in the world. We visited the royal palace, the famous Monte Carlo casino, and walked around the immaculately manicured streets during our short visit. Casey geeked out a bit over the ridiculously expensive cars that frequented the streets, and especially enjoyed seeing the Formula 1 track that runs right through the city. Stay tuned for the second half of our trip to learn how we let ourselves get swindled in Africa, saw dead people in Palermo, and fell even deeper in love with Spain as we spend more time in Barcelona, and then visit Granada and Sevilla with our friends! 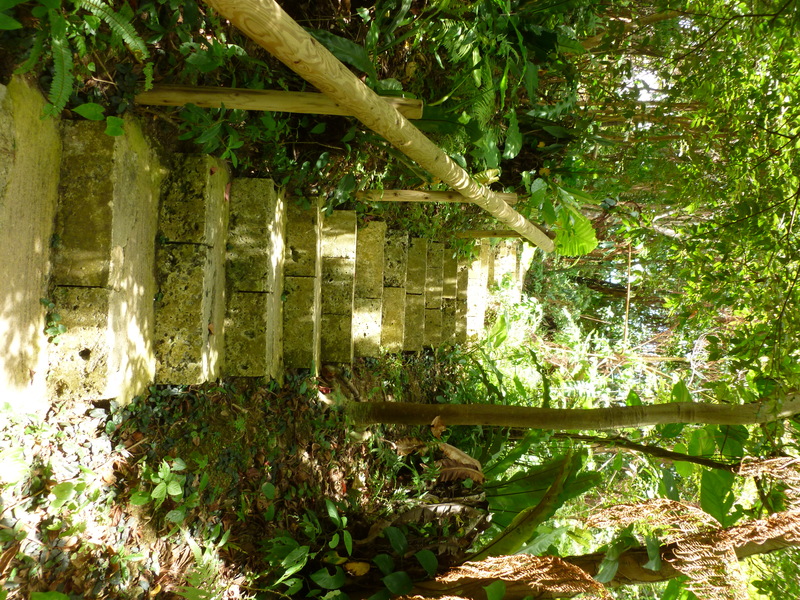 We ventured through all of the paths we could find, climbing beautiful sets of stone staircases along the way. Casey showed off his skills on stilts (after which some adorable elderly Japanese women smiled and told him to be careful). 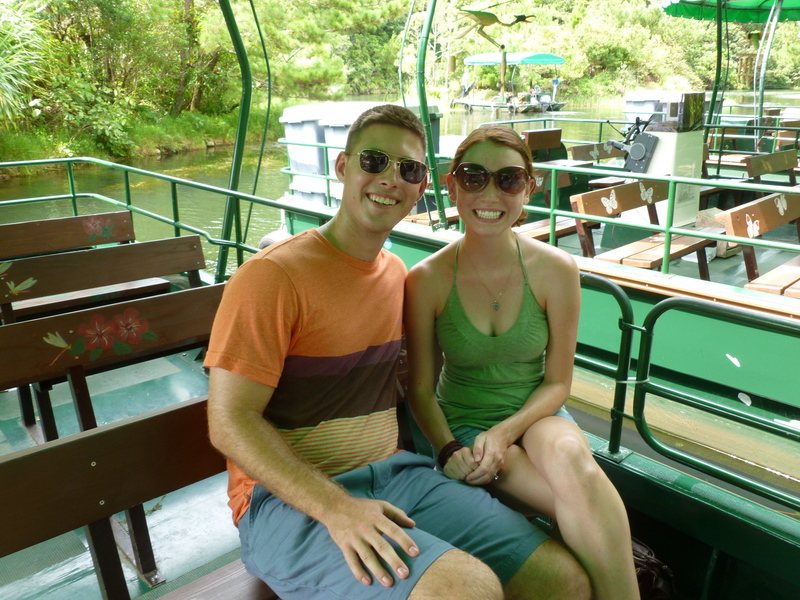 We then took a leisurely boat ride guided by a funny little Japanese man. I know that he was funny because he must have been telling jokes in Japanese while he led the tour down the river, as the rest of the boat passengers kept laughing. I could understand almost one out of every ten words he spoke, so unfortunately his jokes were lost on us. Fortunately, we were there for the scenery rather than the comedy show, so all was not lost. 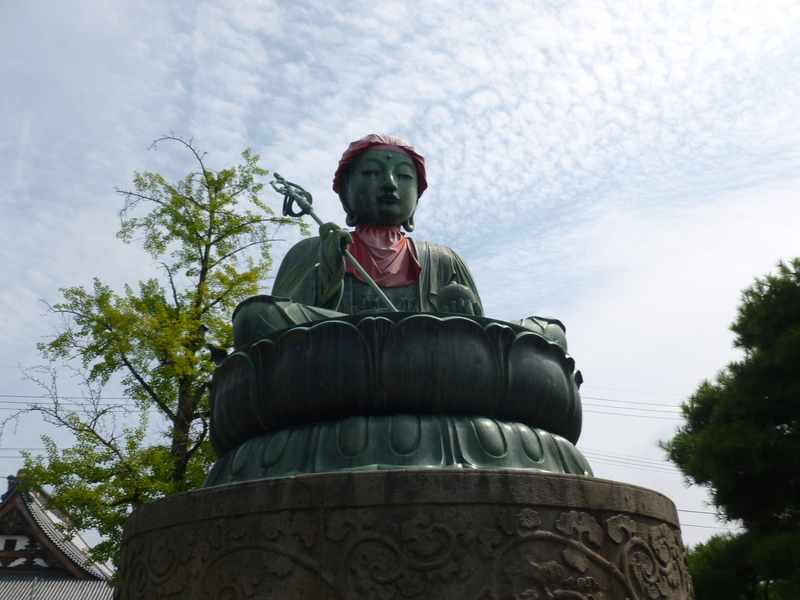 (It did, however, renew my motivation to achieve fluency in Japanese). 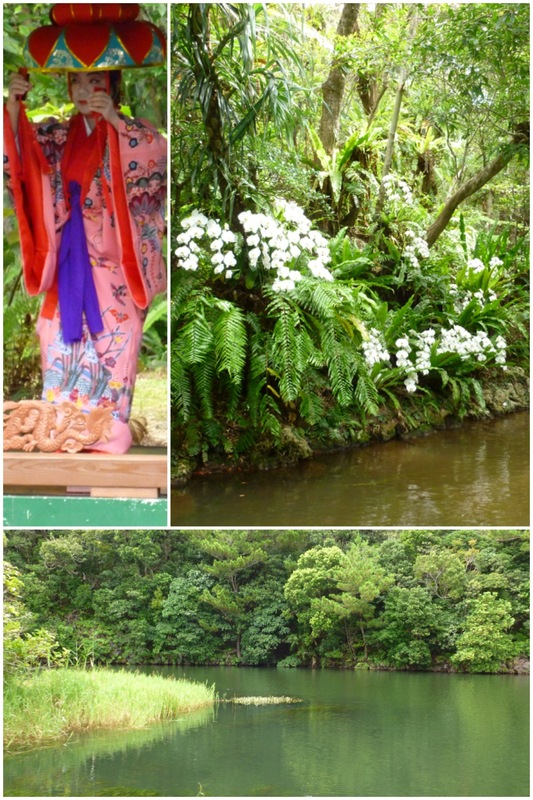 Along the way, we saw gorgeous orchids, a sad ox taking a bath, and a beautiful woman in traditional Okinawan garb. 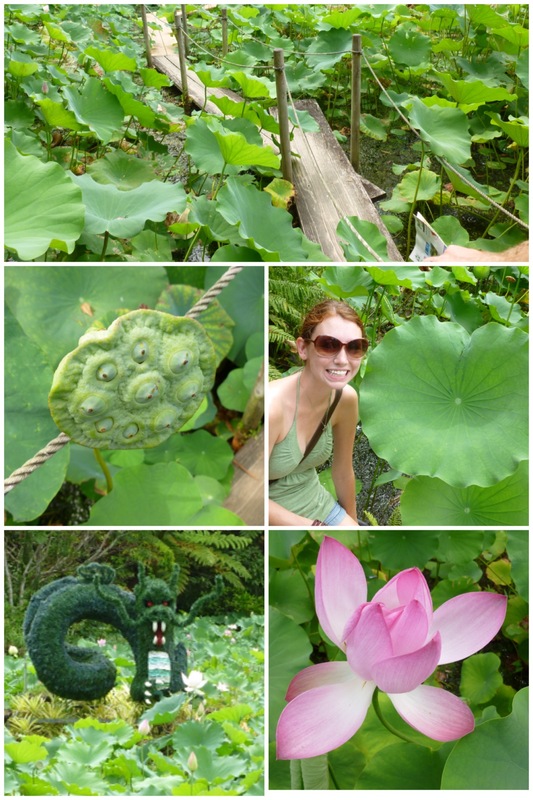 After our boat ride, we trekked through this awesome bunch of lily pads, along a little bridge built out of rope and 2 x 8 boards, dodging banana spiders all the way. Overall, it was a great day spent with my love. I am always inspired by the respect and reverence the Okinawans show for the land they call home. We have so many more adventures to share here, and I am already dreading the moment when we leave this gorgeous rock. A few weeks ago, Casey and I went out with a group of friends to witness one of the most beautiful places I have ever seen. 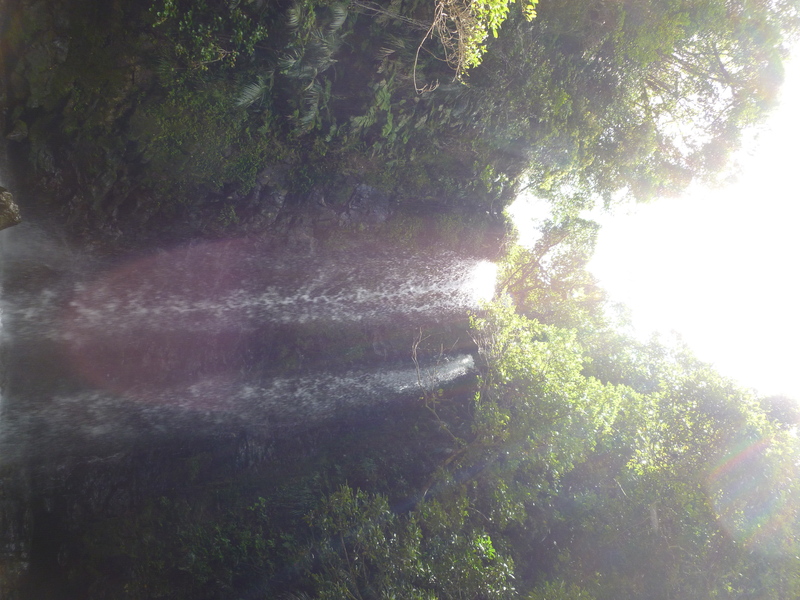 About an hour north of the base where we live is Tadake Falls, a gorgeous waterfall hidden in the Okinawan jungle. 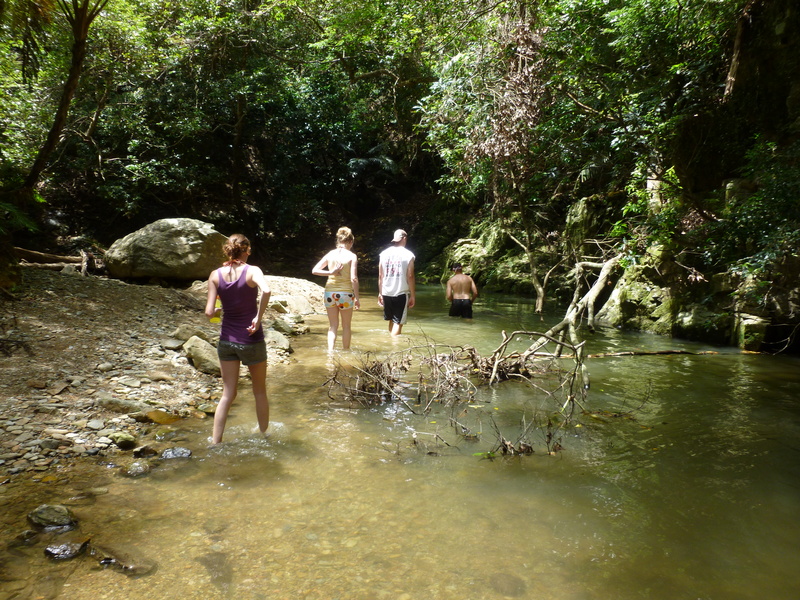 We trekked along a small river, climbing slippery rocks and dodging giant wasp-like horse flies and floating palm-sized spiders. 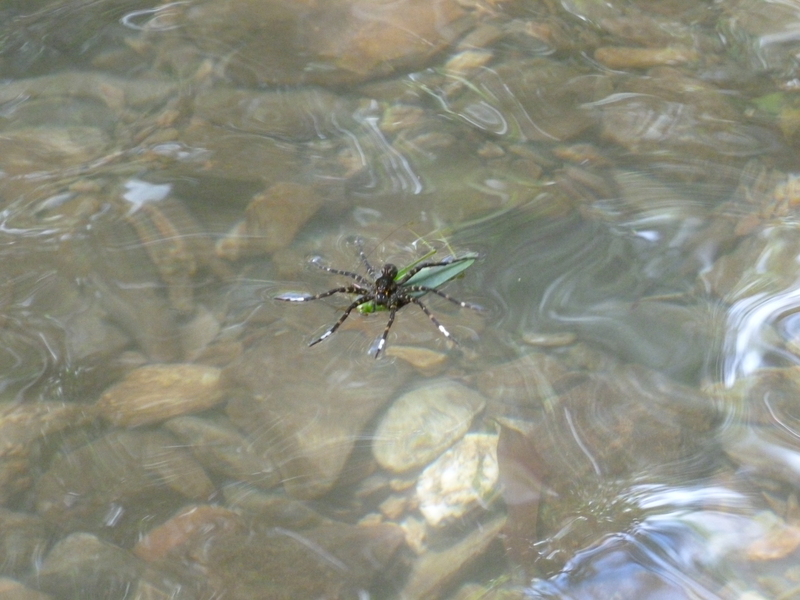 (This monster was floating along on a raft fashioned from a live grasshopper). At various points along the river, we hiked over slippery rocks and swam across fairly swiftly-moving portions of the river. Casey, unable to resist an opportunity to play Tarzan, stopped to jump from a small cliff into the river. 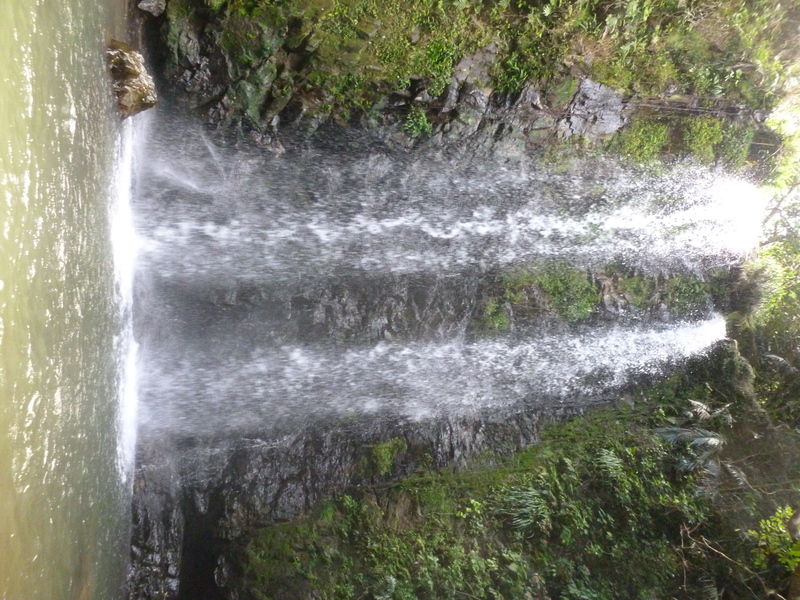 When we arrived at the waterfall, I was amazed at how massive it was. 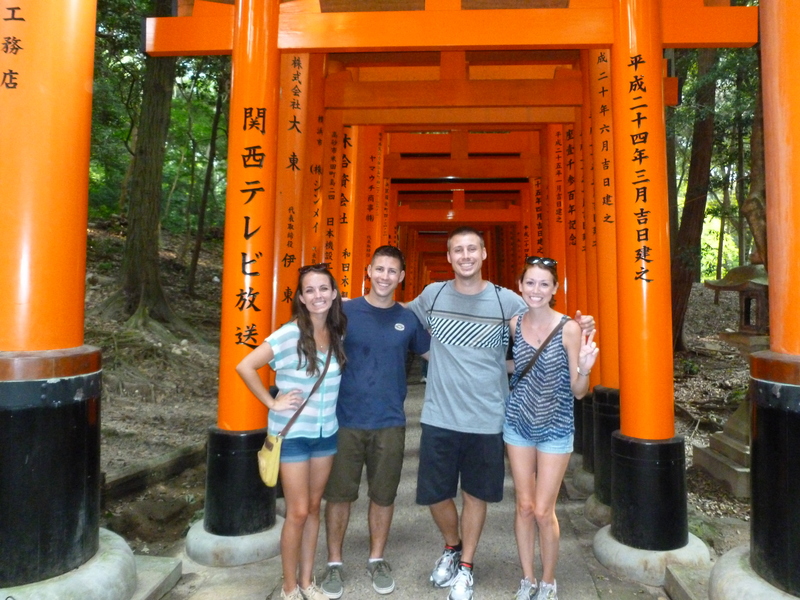 This definitely made the list of places in Okinawa I will never forget. I recently came back to Japan after a 7-week-long trip to America, in which I watched two of my best friends get married and met another one’s new baby girl, among many other things. I am just now adjusting to my own life here in Okinawa again, and am finally ready to get back to blogging! The most difficult thing this trip forced me to unlearn and relearn is driving! 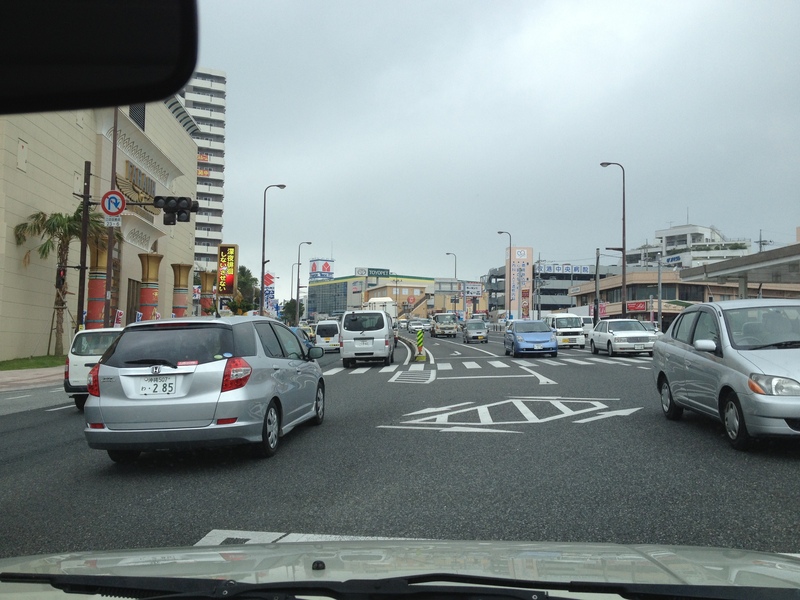 There are so many differences related to driving in Japan and America. First of all, in Japan, we drive on the left side of the road. When we moved here almost 9 months ago, Casey and I had to take a written test in order to receive our SOFA-status drivers’ licenses. We had to learn the laws of the road, but no one held our hands through learning how to navigate this place. The switch to the left side of the road was difficult because (duh), we had been driving on the right side since we were 15! I was so terrified to drive out here, that Casey had to force me to start driving about 2 weeks in. (We went out with friends and he decided to drink, meaning that I became the de facto designated driver. I wasn’t happy). 2. Fast lane, passing lane, bus lane: all different. 4. Parking lots. Yes, they are backwards, too. 5.The driver sits on the right. Sometimes, I still try to get in on the wrong side. (It’s been 9 months). Fortunately for me, I’ve had an adorable car in which to learn all of this. 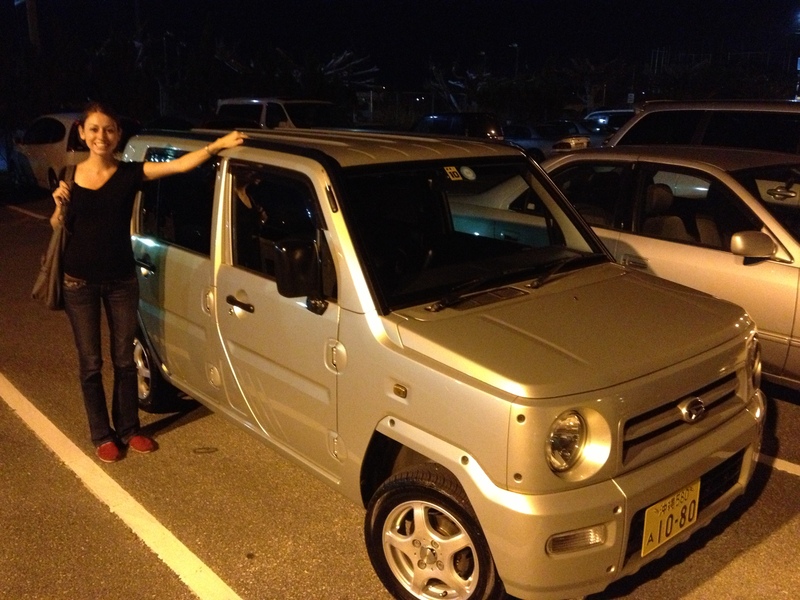 This is “Turtle car.” She is a 2003 Daihatsu Naked. Yes, Naked. (The Japanese love English words, and often show little regard for the meaning of the word when they choose it. More on that in another post)! She has a whopping 750cc engine, which for you less mechanically intelligent (like myself) out there, means the engine is smaller than the one in Casey’s Harley Sportster. In short: tiny. She has a difficult time making it up hills, or going over 60km per hour, which for you Americans out there is only about 37 miles per hour. She is like a mini Hummer, complete with golf cart tires, a rubberized interior, removable backseats, retractable side mirrors (very common in Japan because the roads and parking areas are so narrow), and lots of love to spare. You might be able to see Casey’s Toyota Camry Gracia parked next to Turtle car. As you can probably see, the Camry is much larger, which is why we do not often drive it around Okinawa. While not a large car in America, in Okinawa it is like driving a boat. It has a normal-sized engine, but a bad turning radius and we often have a hard time finding a parking space big enough for it! Also, my car is much cheaper to drive because it is awesome on gas and the road taxes are so cheap because the Japanese government subsidizes efficient cars! Small, or “kei” cars with yellow license plates are common in Japan because the road taxes are about 90% less than that of more American-sized vehicles, like the Camry! Overall, however, it can be a beautiful place to drive. 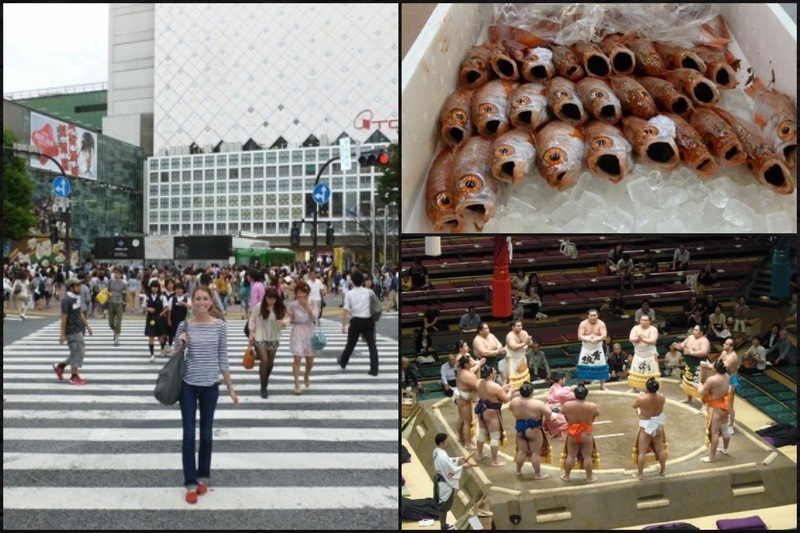 After spending 6 months in Okinawa, it was time for me to go back to the states for a visit. The idea of driving back in the states was terrifying to me for a few reasons. 1. I would need to relearn to drive on the right, and Americans would be much less forgiving than the Okinawans, who are used to Americans driving on the wrong side when they first arrive on island. 2. Everything moves a good deal faster in America. 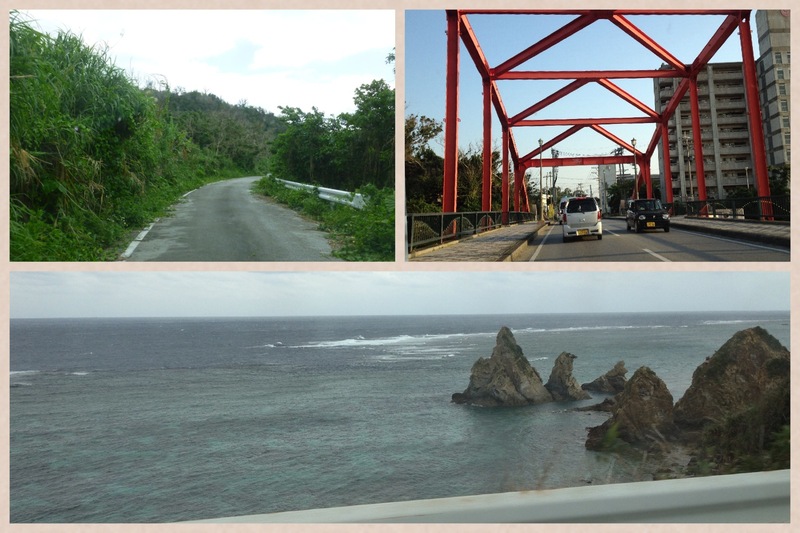 The fastest speed limit I’ve seen on Okinawa is 80 km, which is about 50 miles per hour! 4. America is much more dangerous than Okinawa. 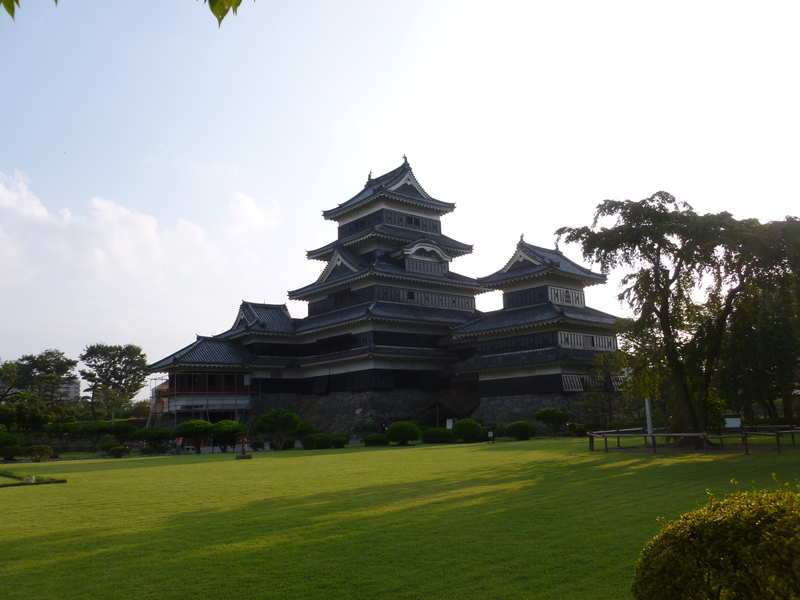 In Japanese culture, it is very uncommon for women to get kidnapped, raped, or mugged. I was going to be driving by myself through some cities which are known for the frequency of these crimes, and could not help but be worried after feeling so safe on my little island. 5. Worst of all, I would need to stop at red lights again. 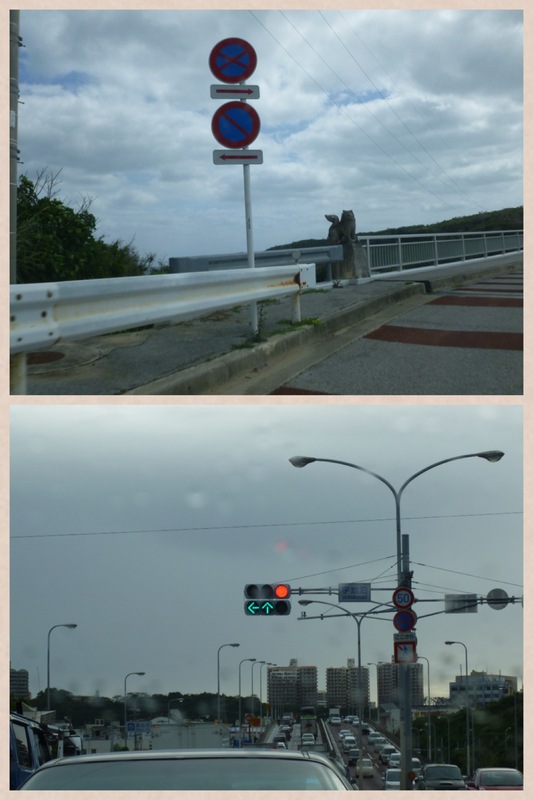 In Okinawa, it is safer to go through a red light than stop short because everyone behind you is already planning to run it. Yeah, sure, you have to wait a few seconds before driving when the light turns green, but it feels so good to run those red lights! 1. Turning lanes. These are important, and Japan should install them. 2. Roads sized large enough to fit cars. It’s easy to forget how nice this is. 3. Fair arbitration of car accidents. In Okinawa, an American involved in an accident will always be at fault. The accident would not have happened if you weren’t on Okinawa, period. 4. Road and highway names make life so much easier. 5. Motorcycles aren’t… terrifying! Out here they drive like maniacs in flip flops with unbuckled helmets! They do wheelies at stop lights, drive in between lanes to speed past traffic, and drive up to the front of the line at stoplights. To deal with them safely, you have to view them as suicidal so that you remember to steer clear of them, literally. 6. 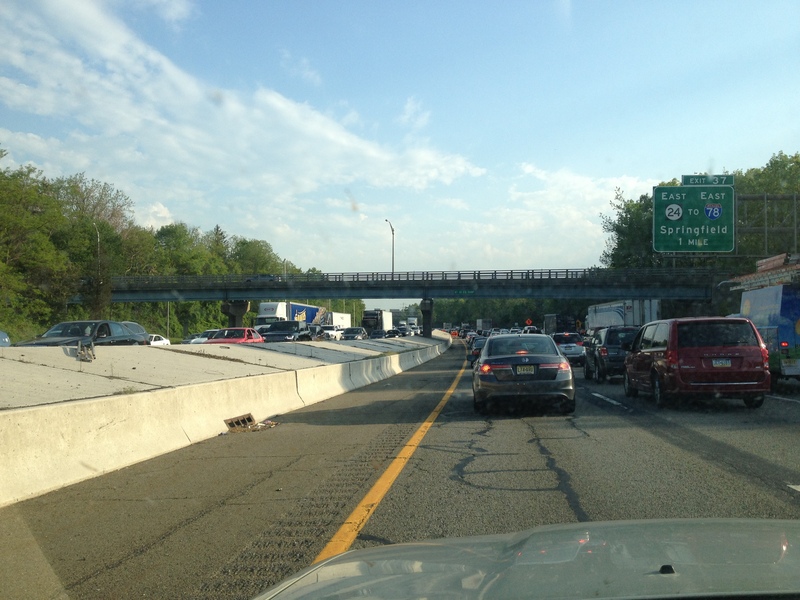 Shoulders, bicycle lanes, HOV lanes, parking lots for businesses, and the Jersey Turnpike. (Just kidding, folks. Seriously, it was a joke). I dealt with all of my concerns, but in end I made it through my travels. I drove over 3000 miles in my parents’ trusty Subaru Forester, only breaking down once. I sent Americans the “Oki wave” a few times, resisted the urge to thank/thoroughly confuse courteous drivers with a flash of my hazards, and kept the doors locked at all times. I dealt with stop-and-go traffic, speed demons, and road rage just like the old days. 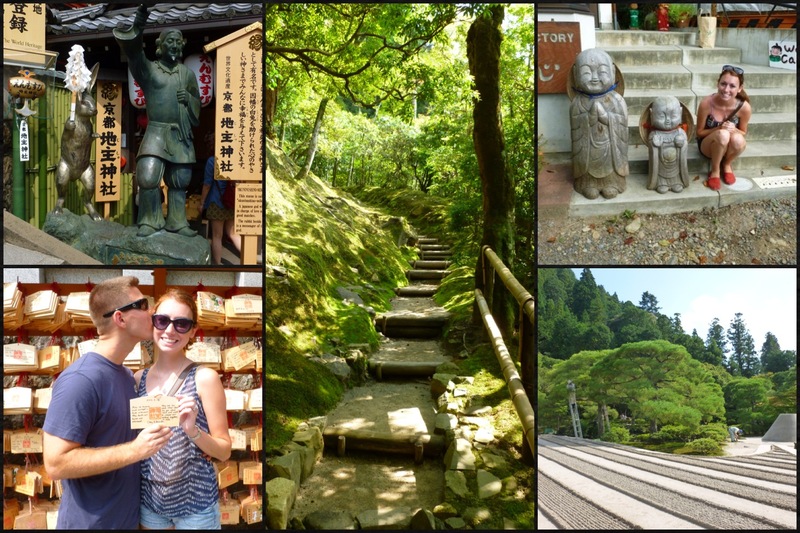 And then I came back to Okinawa and learned it all over again. PS. The turn signal makes so much more sense on the right side. That is all!